The geological history of the Green River is quite interesting. 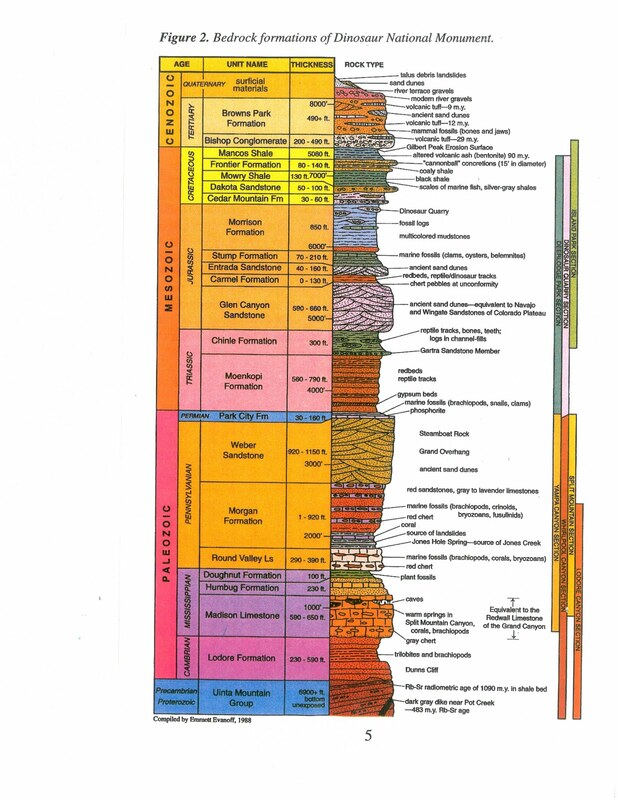 It all started about 1 billion years ago, in the Precambrian era. 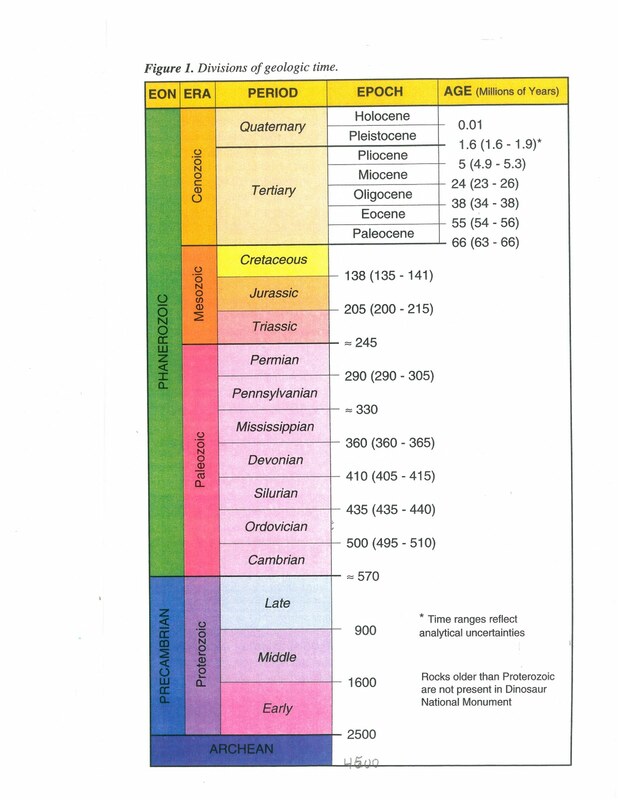 I will point out some of the highlights of the geologic history of the area. 2. The Uinta Mountain Group was tilted and eroded away to make an angular unconformity. 4. 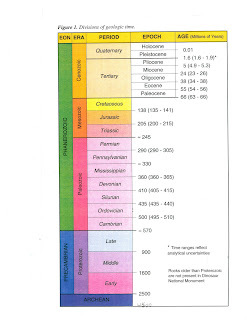 Erosion occured and wiped away almost 200 million years of history. This is called a disconformity. 5. Magma intruded into the crust to form a dike about 483 million years ago. 6. The Mississippian Madison limestone was deposited on the eroded Lodore formation (about 350 million years ago). 7. Sand dunes formed the Pennsylvanian Weber sandstone. 8. 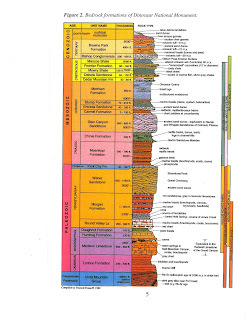 A shallow tropical sea formed the limestone and phosphorite of the Permian Park City formation. 9. Streams deposited the upper Triassic Chinle formation on a eroded Moenkopi. 10. The Glen Canyon sandstone formed from sand dunes in the Jurassic era (about 180 million years ago). 11. Rivers and lakes deposited the Morrison formation which includes dinosaurs in the Jurassic. This layer contains the dinosaur fossils that make Vernal famous. 12. The Cretaceous period ended about 65 million years ago. The interior seaway that reached the area in this era flooded, which led to the depositing of the Dakota, Mancos, and other layers. These layers were all deposited before the Uintas were formed. 13. The Uinta Mountains formed as part of the Laramide Orogeny which built the Rocky Mountains between about 60 and 30 million years ago. All the rocks previously mentioned were arched up and faulted. The Uinta Arch, Mitten Park Fault, Island Park Syncline, Split Mountain Anticline formed at this time. (Although, Split Mountain was not a split yet). 14. About 30 million years ago the Uinta Mountains were almost completely eroded away. This is called the Gilbert Peak Erosion surface. 15. Between 28 and 12 million years ago streams deposited the Bishop Conglomerate and Browns Park Formation. These sit on an angular unconformity. 16. About 10 million years ago, uplift of the Colorado Plateau and Rockies began to elevate the area. This caused the Green River and its tributaries cut down into the rock causing rejuvenation. 17. Pleistocene glaciers created the landscape of the high Uintas. Higher stream flows deposited gravel terraces like the ones we saw at Island Park. 18. The Green River and its tributaries eroded to create the landscape we see today. As number 18 says erosion and deposition created the amazing landscape we saw on the trip. The landscape along Green and Yampa Rivers are great examples of geologic processes. This is a very cool thing to look at. I really recommend going on a river trip and looking at the mountains and other formations and seeing first hand what they look like. The rapids are a blast, they feed you well and even just floating down the river is nice and relaxing.